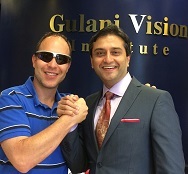 Over the last three decades, Dr. Gulani has seen practically every possible pattern of Radial Keratotomy (RK) cases in his experience of correcting post-RK Vision for patients worldwide. Refraction is what starts the thought process with every patient. It doesn’t matter if the cornea has opacity. The refraction is what we concentrate on. Refraction helps provide a pathway to improve someone’s vision notwithstanding the number, pattern, or irregularity and density of cuts. 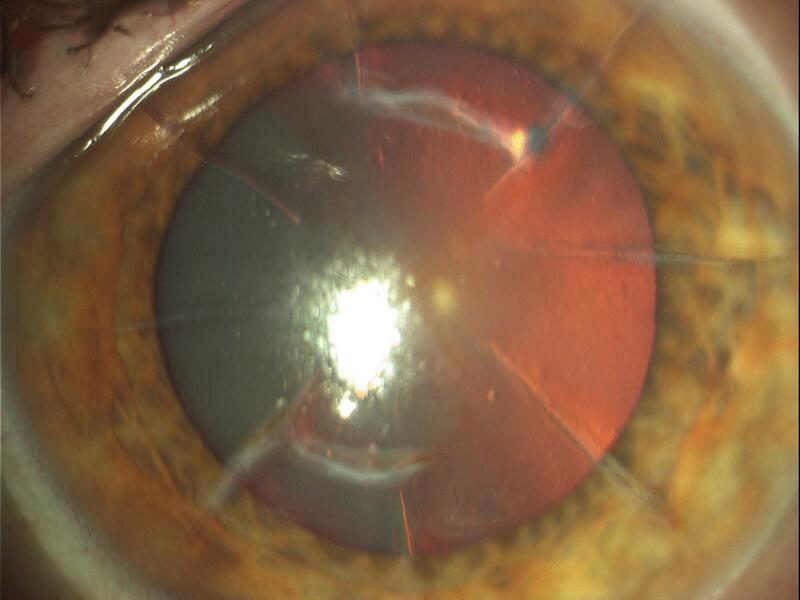 Using the Gulani 5S system, cornea-based RK correction presentations always have Sight (meaning these patients can see). This may even be through a hard contact lens correction, but they always have sight. All they’re telling us is there is potential to see, so we should not give up. The next “S” in the 5S system that is affected is Shape. 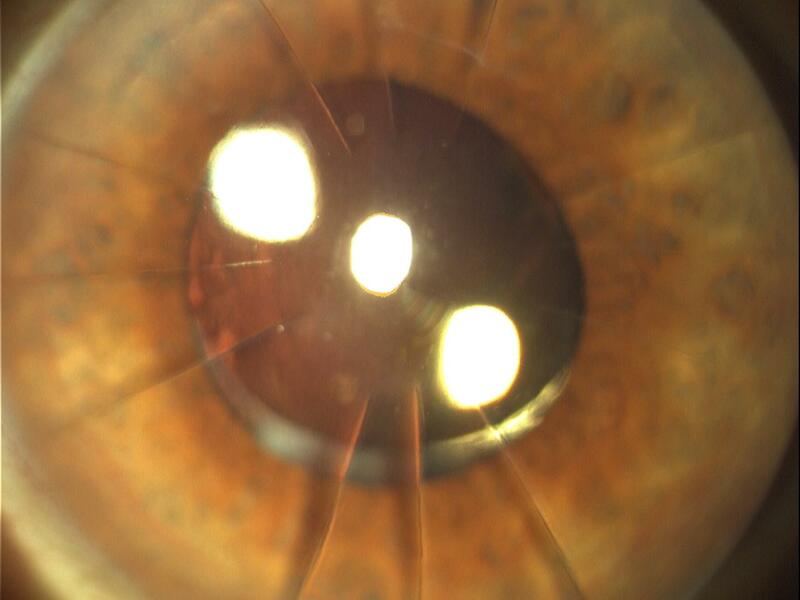 These patients are either too flat from Radial keratotomy and became hyperopic (they also in most cases have presbyopia due to age), and many of them have astigmatism either uncorrected or due to incorrect RK surgery. The next “S” that could be affected is Strength, especially if these patients have Fuchs’ dystrophy (thicker cornea), or if the cornea has thinned in some areas as a result of ectasia (or pre-surgical forme fruste keratoconus). Site is usually clear centrally (though the usual 3-mm optical zone (OZ) may need enlarging) since Radial Keratotomy was done in the periphery. In some cases central Site is affected by dense central scars, thus affecting the fifth S (Scar). Now that we understand how eyes with RK correction needs are qualified in the 5S system, we see the plan of action unfolding. In a majority of cases, the Strength is not affected and there is no central Scar (Figure 3). Many of these cases can undergo excimer laser ASA/PRK. 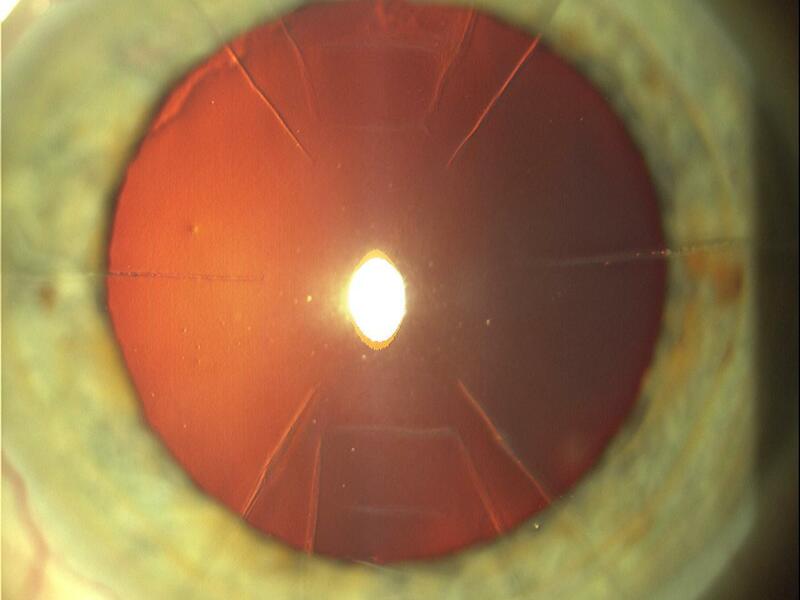 Applying laser ASA/PRK not only can correct the shape of the cornea (hyperopic, myopic, or astigmatism), but also allows for the new epithelium to come back to smooth the irregular anterior cornea. In anecdotal experience, the perception of the returning new epithelium after the PRK reshaping of the cornea to act like a smooth carpet over underlying, broken tiles (the broken tiles being the RK cut cornea underneath). This new carpet gives us the shape we want irrespective of the cuts below and also improves the smoothness of the anterior corneal surface. 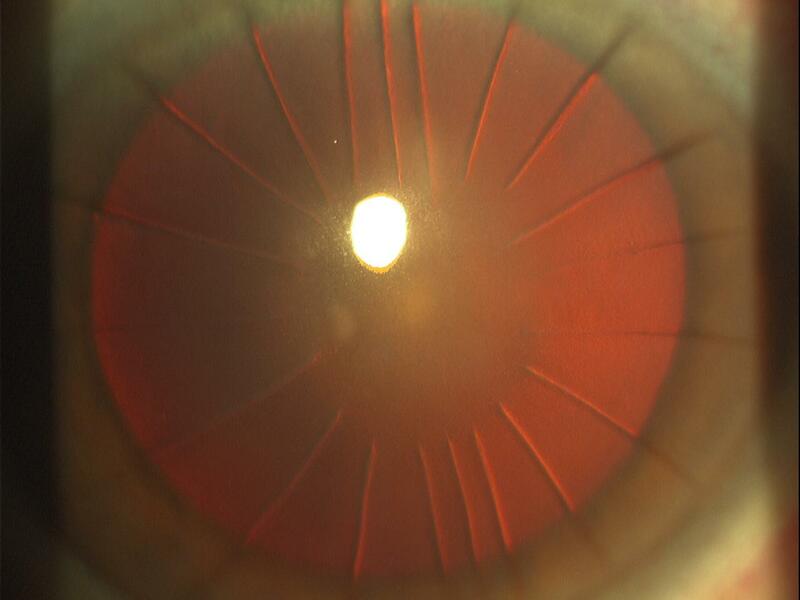 Additionally, it decreases the refractive fluctuation by holding the underlying RK incisions much more tightly. 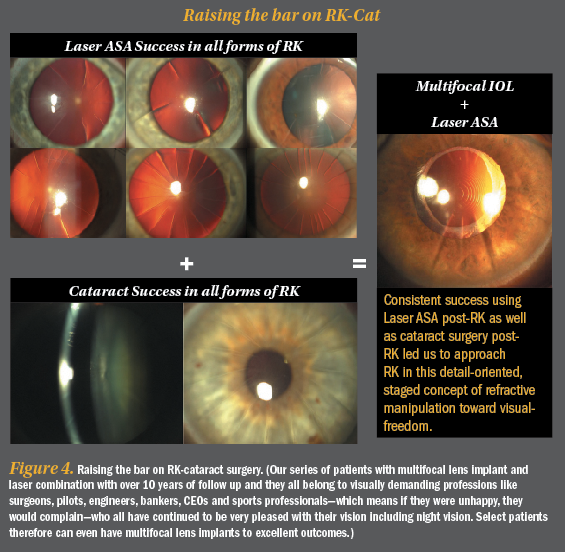 This concept along with the laser ASA/PRK reshaping then expands the optical zone (most RK surgery was done with 3 mm OZ) and also translates to improve night vision and halos associated with RK. This concept follows our Corneoplastique theme wherein the anterior corneal curvature overrides the posterior curvature and imperfections (including scars or RK incisions). Using this concept, very much like corneal scars, we can disregard the RK incisions/pattern or number and concentrate on re-shaping the front cornea. • Sight—Is there potential for vision? If yes, it is our duty to fight for the patient and take them higher. • Shape—All refractive surgeries are about shape. 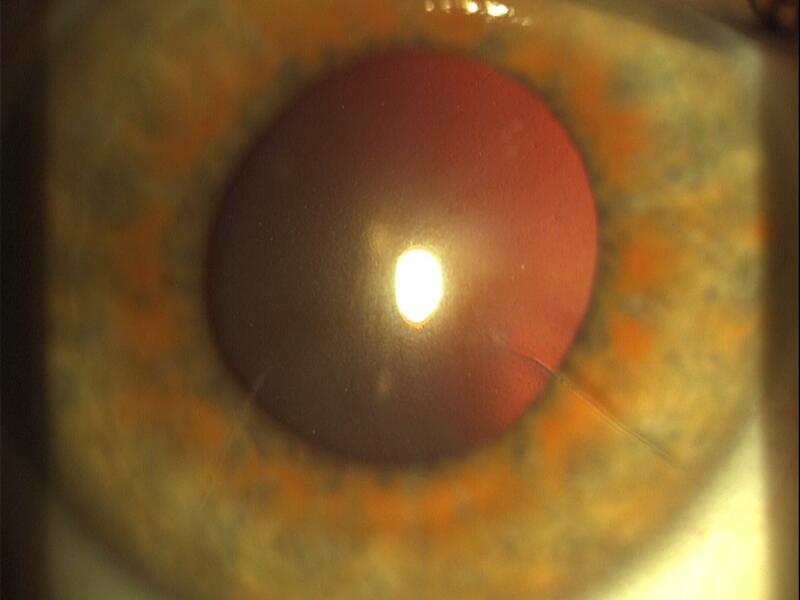 • Scar—Is the cornea clear or does it have an opacity? • Strength—Is the cornea thicker or thinner than normal? • Site—Is the center affected or is the periphery? Don’t worry about the periphery as long as the patient can see through the center. Manual epithelium removal since manual removal allows us to feel the cornea, the RK incisions and their delicate architecture (No alcohol needed for patient or for surgeon). All other parameters of surgery are same as in any case including bandage contact lens application and most of these cases heal by day 5 postoperatively with no additional pain or discomfort. Of course, all of these laser ASA/PRK procedures can be followed by crosslinking of the cornea to decrease any remaining fluctuation and create a permanent visual outcome. Having addressed the majority of the presenting RK corneal or refractive errors with the above-mentioned concepts—addressing the Shape and Sight—let’s move on to the less common RK-corneal presentations, which may include central scarring without affecting the strength of these corneas. 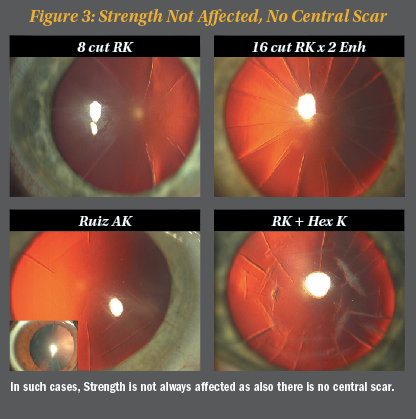 In some cases of RK corneal presentations, the Strength may additionally be affected. 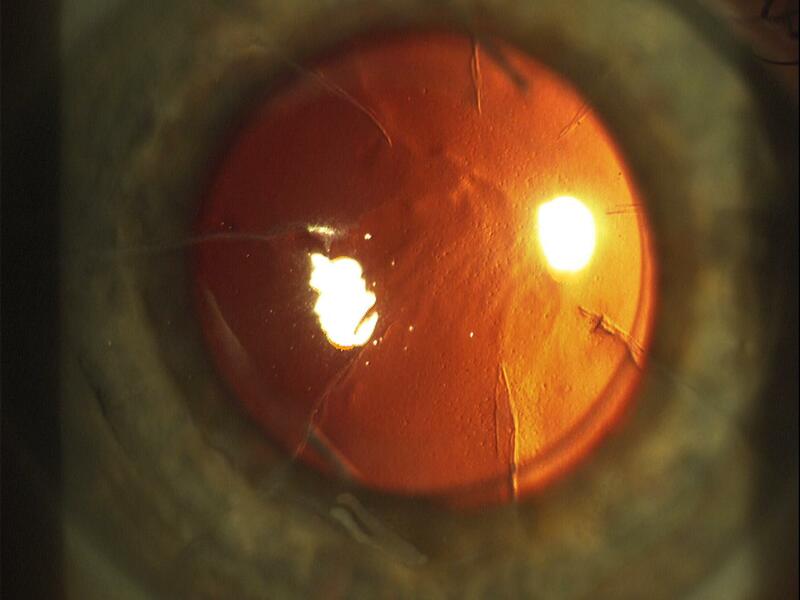 In cases of Fuchs’ dystrophy, DMEK/DSAEK can be done to prepare the cornea for vision surgery. 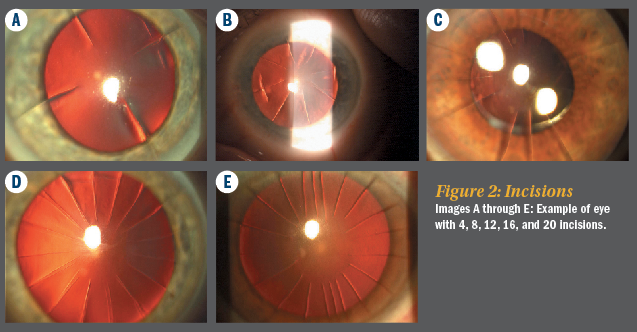 In cases with excessive structural compromise—including thinning and ectasia, especially with central scar—we can plan to apply the 5S system and see that to correct all of the affected S systems, we may need to perform a lamellar corneal transplant. 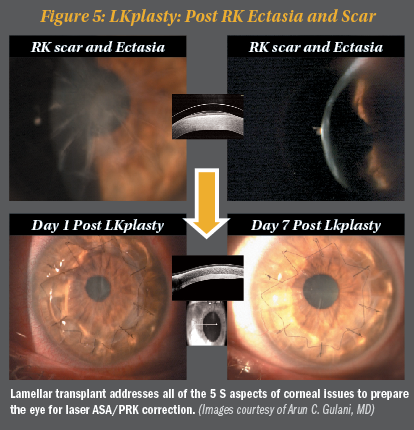 A lamellar transplant thus addresses all of the corneal problems—Sight, Shape, Scar, Strength, and Site—in preparing for laser ASA/PRK correction after 6 months (Gulani concept of cornea as a vision rehabilitative platform; see Figure 5). 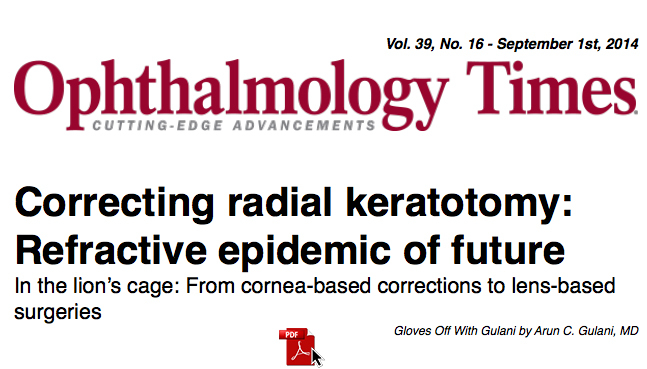 Having addressed most corneal presentations of RK cases (we have not discussed cataract and lens-based surgeries, but we will review those in the second part of this column), I don't even want you to call it “RK.” Let’s once again stay away from terminology (RK) that causes despair in surgeon and patient from mere mention of it or “knee-jerk” procedures with failing confidence toward possible emmetropia in every case. Don’t be scared by the appearance of RK scars. Smile; appreciate the patient’s previous RK surgeon and create a plan for vision. These patients are already well educated and motivated (That is why they had this new surgical technique of the 1980s to begin with). 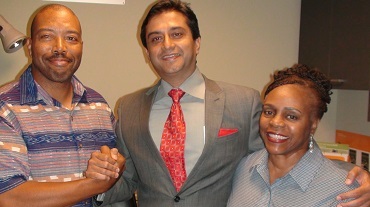 Appreciate the attempt of the RK surgeons, who 20 years ago did the best they could in helping these patients. Let us also not forget that many of these patients did in fact enjoy their life with post RK vision. Additionally, do not forget that these “Early Adapters” were type A personality then and are Type A today. They still are very well read, well researched, and always wanting and expecting the best possible vision. Refraction is what starts my thought process with every patient. 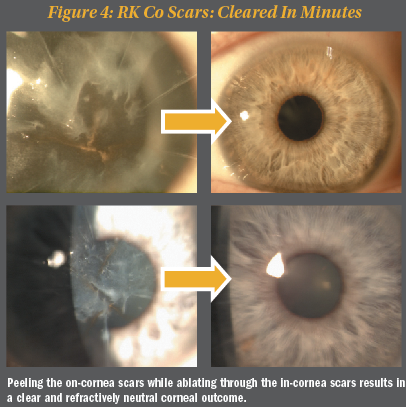 Just like in corneal scar cases, we disregard the RK incisions and focus on the visual capacity of the eye always trying to manipulate the optical elements of the eye in reaching emmetropia/BVP. 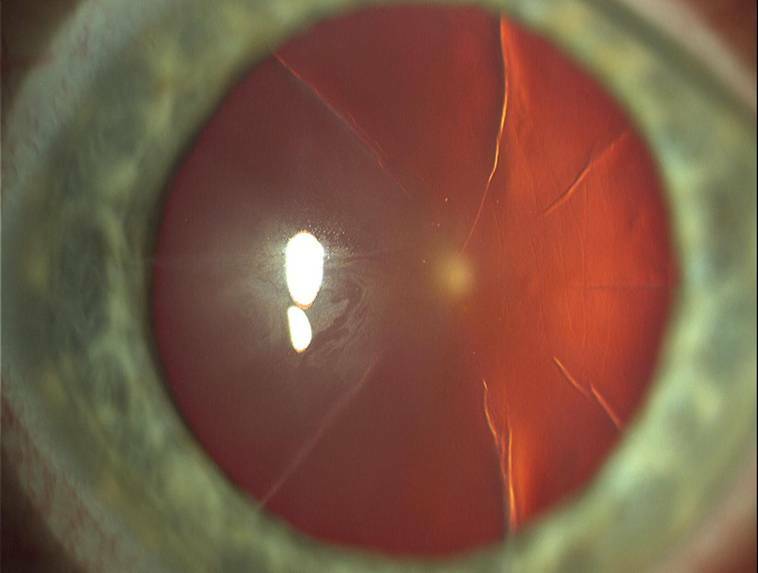 Even though these eyes have a cataract, if you concentrate on the refractive outcome, the surgery itself it not as daunting as you may think. Follow our 5S system (see sidebar) to collect the correctable elements of the RK cornea (as we did in our last column) and make a plan to correct the decreased vision resulting from the cataract. Using our 5S system, in most eyes, the corneal scars (cuts), shape, and thickness are all normal, and the site centrally is clear and okay. It’s the Sight that is affected by cataract. Most of these patients present after they’ve become presbyopic, as they’re in their 50s or so. In many cases, they will additionally have hyperopia and astigmatism too. They are frustrated because they have virtually no good vision distance or near. Cataract surgery is our excuse to get back to their good vision. Once the above are listed (primary and secondary factors) and determined, the plan simply unfolds in front of your eyes. The seemingly complex eye now provides an opportunity to remove the cataract (blurriness) and optically manipulate the interior using specific lens implants to then fine tune/modify or complete our emmetropic quest toward BVP using the cornea as our “Vision Rehabilitative Platform. This is what is called “Refractive Surgery” to the “Rescue” using the most accurate and elegant way to correct vision components with least intervention. 1. Select the site of incision (and also your sitting position) based on the axis of astigmatism and available space between two radial incisions. Use clear corneal incisions for patients with under 20 RK incisions, and limbal or scleral tunnel incisions in cases of more than 20 incisions. Sometimes, 16 incisions done irregularly or asymmetrically may also force you to avoid the cornea, so evaluate each case individually. 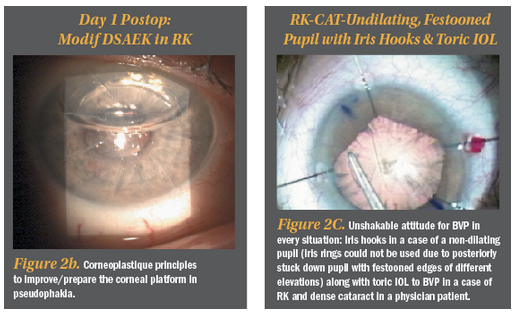 In the majority of cataract surgery incisions, normal hydration techniques will need to be slightly modified to ensure the previous RK incisions don’t leak. A 3-point technique is used where we not only hydrate the medial and lateral side of the main incision but also centripetally into the lip of the incision. We have also successfully used and propose the recently FDA approved ReSure Sealant. Of course, good ol’ sutures are always a back up. 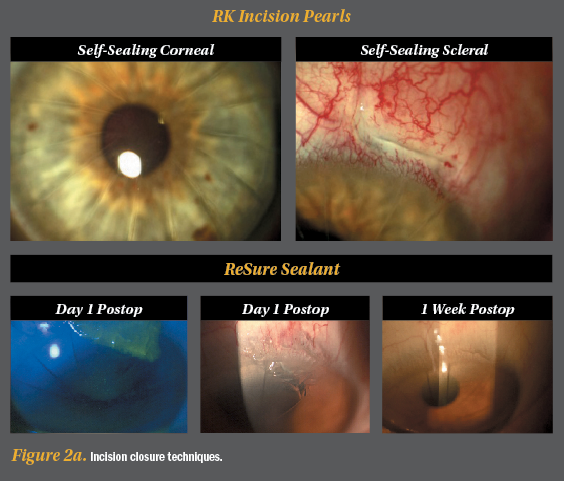 A leaking RK incision is something you do not want but do resist the urge to use sutures without adequate reason as you will induce astigmatism and healing delays. 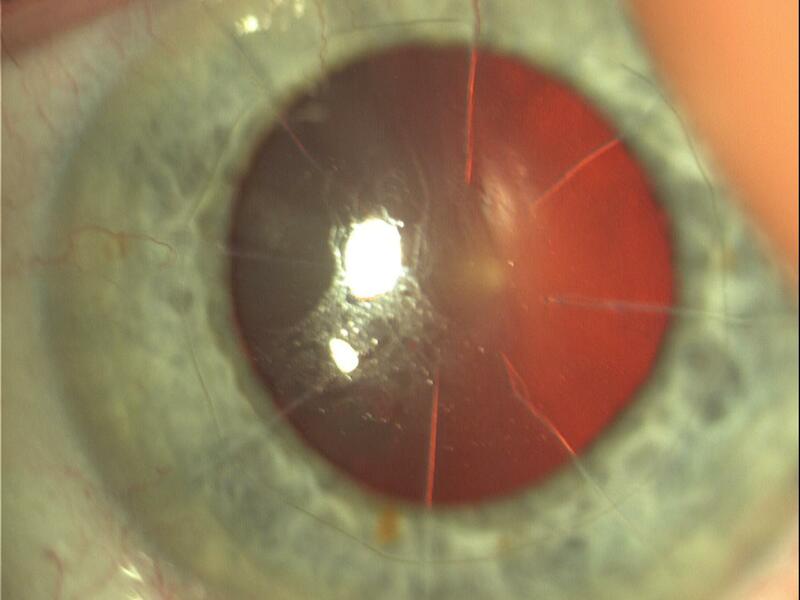 Most corneal incisions seal and heal very well by correct hydration techniques. If adjacent RK incisions does come apart, stop surgery, evaluate and suture that incision in a step ladder fashion (minimal sutures with parallel long bites with minimal stress). Resume surgery and your composure without being distracted by these sutures. 2. Gulani Phaco-Feed technique: we use low-flow phacoemulsification or phacochop techniques to keep the pressure in the eye down as you work. Also keep the phaco hand piece stationary in the incision (so as not to torque or cause stress on the adjacent RK incisions) and feed the cataract with your second hand/instrument into it. In other words manipulate with the second instrument while staying steady with your phaco handpiece. Femtosecond lasers can be used with no change in protocol or technique to enhance our consistency in capsulorhexis and lens fragmentation which lead the way to successive, next surgical steps in RK cases. 3. Always remember that these patients were once myopic in refraction (even though today they may be presenting with hyperopia) and still have the myope’s ocular anatomy, so all the risks of cataract surgery in myopia, such as a deep anterior chamber during surgery, and all risks of retinal implications still apply. Do a thorough preoperative and postoperative check. 4. 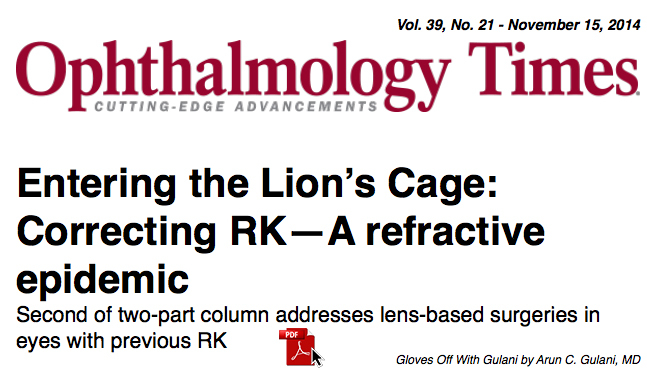 Visibility sometimes can be hindered if the RK and AK incision pattern reflects and distorts the microscope lights. 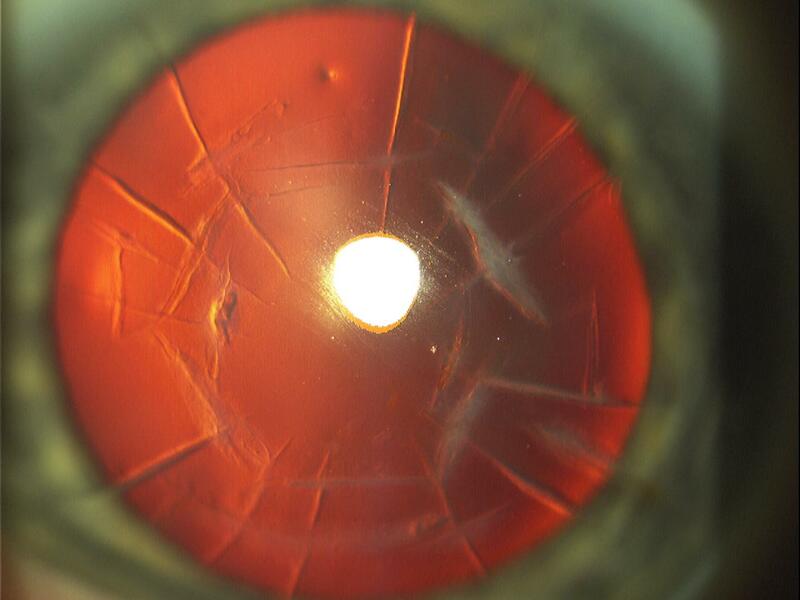 Establish landmarks like the edge of your capsulorhexis and corneal anatomy so you don’t get fooled by light reflexes. A blob of Viscoat on the cornea may help in such cases. 5. There are numerous sites with formulas and approaches to post RK-IOL calculations and I encourage you to use the one with which you’ve had the most success. 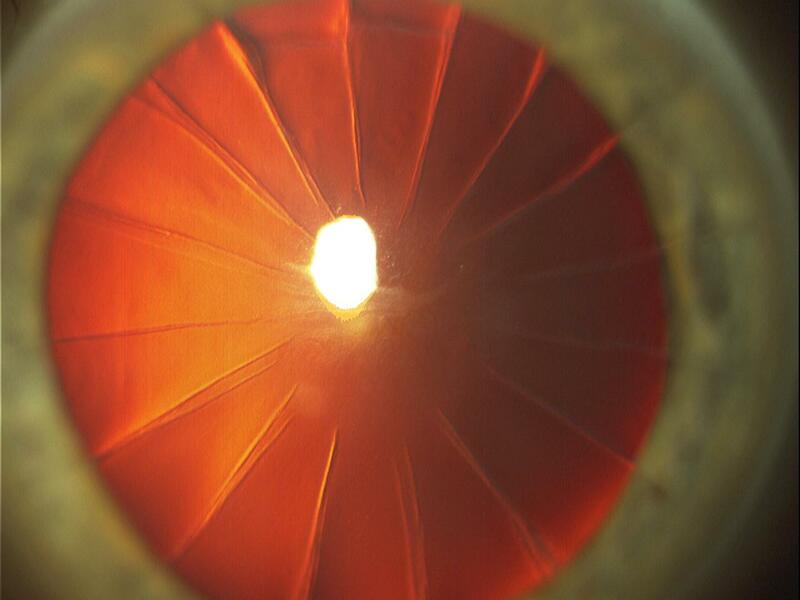 Intraoperative devices like the Wavetec ORA can also be used to further ensure the accuracy of lens powers. 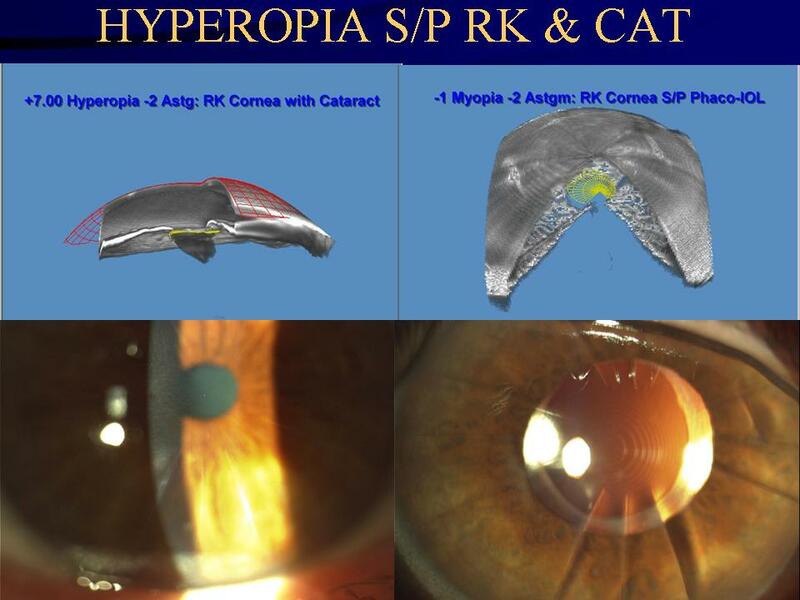 Always aim between emmetropia and myopia: That will not only combat any hyperopic shift or refractive fluctuation, but myopic laser ASA allows you to increase optical zone and clear central cornea of irregular astigmatism (both of these additionally help night vision to further enhance patient gratification). Using the above mentioned pearls, plan for single stage cataract surgery to correct blurry vision (cloudy cataract) and also refractive errors (ie. 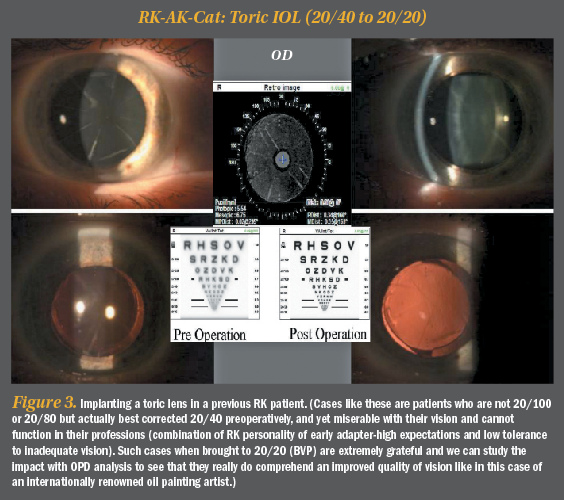 with Toric IOL if needed) or Two-staged surgery where you result in myopia and then perform Laser ASA as second stage to correct residual refractive error, expand optical zone and clear central corneal irregularities and scars if present. Additionally, you can use Collagen Cross Linking procedures to further permanize the corneal result you have so laboriously obtained especially if you have worked on the cornea. Also, build the cornea or repair it in any of the RK cataract cases with no limits and minimal interventions (Corneoplastique). So, in summary, do not let the previous RK incisions deter you from today’s premium lens technology, patient expectations or BVP goals. 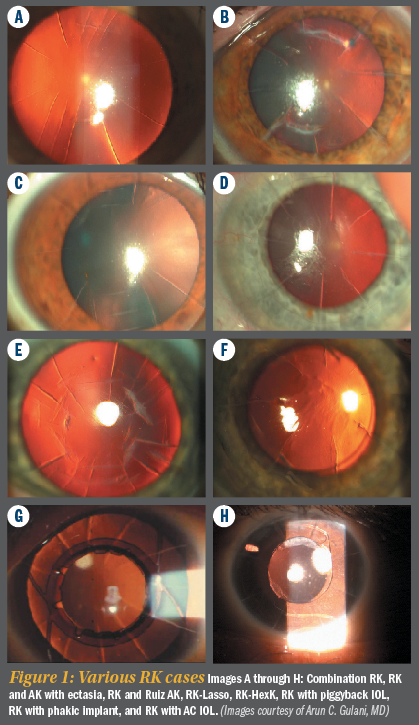 Do keep in mind to establish realistic expectations and explain lower predictability of outcomes compared to virgin eyes in such patients but also don’t forget to still aim for perfection in each of these cases. 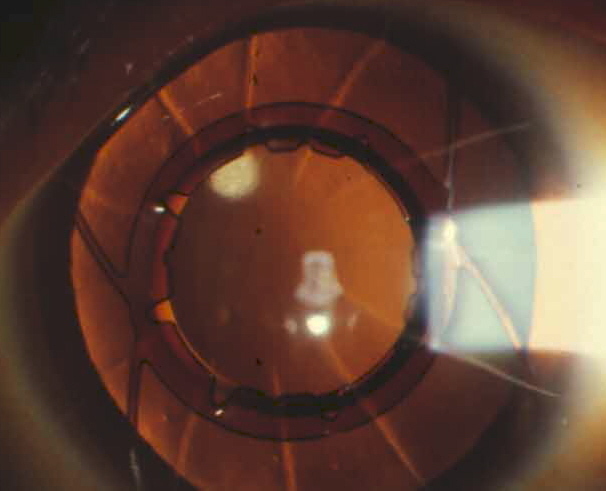 Using such mindsets that blur our difficulty levels (RK incisions and associated refractive challenges) and clarify our vision goals (unshakable desire to get to BVP for each patient), we can truly then bring “refractive surgery to the rescue” in such cases and “turn back the clock” on this refractive epidemic of the future. 1. Gulani AC. Corneoplastique: Art of Vision Surgery. Ind J Ophthalmol 2014;62:3-11. 2. Gulani AC. Shaping the Future and Reshaping the Past: The Art of Vision Surgery. Chapter 98. In: Copeland and Afshari’s Principles and Practice of Cornea. New Delhi, India: Jaypee Brothers Medical Publishers, 2013;2:1252-1273. 3. Donnenfeld E, Gulani AC. Astigmatism correction during cataract surgery. In: Garg H, Alió JL, eds. Femtosecond Laser: Techniques and Technology. 1st ed. Miami; JayPee Highlights Medical Publishers; 2012;21:155-161. 4. Gulani AC. 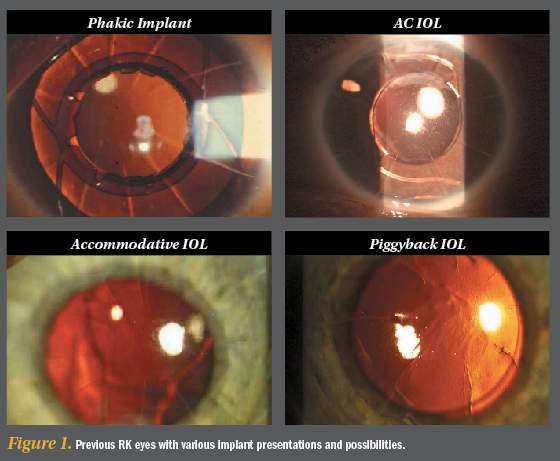 Femtosecond lasers: are they becoming a necessity in Cataract Surgery? Cataract & Refractive Surgery Today. 2013;13:25-26. 5. Gulani, AC. Vision à la carte: Designing vision. Ophthalmology Times. 2013;38(18):31-33.